Patients looking for a comfortable more aesthetic alternative to traditional acrylic or metal partial/full dentures will be interested in flexible dentures available at forest dental. Flexible dentures provide a more cosmetic solution for people by being more aesthetically pleasing than their traditional counterparts. 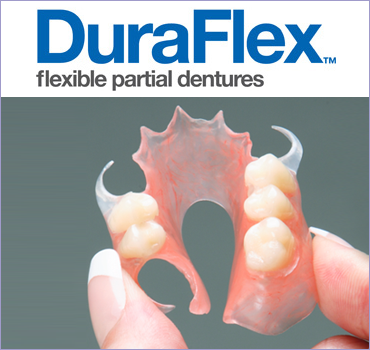 At Forest Dental we are please to be able to offer both Duraflex and Valplast flexible dentures. These materials are nearly transparent and blend in with the natural gum colour in the mouth which makes them almost invisible to the naked eye. 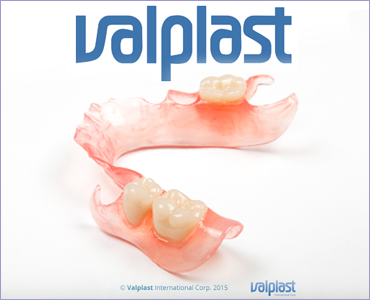 Patients looking for an alternative to dental bridges or dental implants to replace missing teeth will find these the ideal solution and compared to these above actions flexible dentures are a much more cost effective choice. They are also useful as a temporary measure for patients who have has a single tooth extracted and are waiting to have an implant placed as single tooth flexible dentures are more like a removable bridge and as such do not interfere with speech. Flexible dentures and lightweight , hypoallergenic, unbreakable and are supplied with a LIFETIME GUARANTEE against fracture under normal use. They are metal free and do not require any preparation of natural teeth. As they are significantly smaller than acrylic/metal dentures they allow the patient to speak without any difficulty. Dental patients who struggle with their dentures as a result of irregularity in their mouth shape could benefit greatly from the flexible nature due to the fact that it adjusts to each individual. Patients to do not need to worry about the denture feeling loose or dropping down during speech and a a consequence they are hugely popular and well accepted . These dentures can be constructed very quickly typically in 3 weeks and require very few if any adjustments once they have been fitted. Deposits of tartar(a bit like the 'fur' in a kettle) are less likely if your dentures are always kept clean. However, they can be a problem for some people. No commercially Available denture cleanser is effective in removing such deposits and this needs to be done professionally by your dentist or in a dental laboratory, where your dentures can easily be descaled and repolished. Do not use an alkaline peroxide type of cleanser (the ones that make 'fizzy' solutions) as this will cause the material to harden and become rough.